Download "IMAP and SMTP Setup in Email Clients"
1 IMAP and SMTP Setup in Clients Configuring an Client for IMAP Configuring an Client for the SMTP Server Overview Internet Message Access Protocol (IMAP), or a remote connection through an SMTP server, allows the download of messages from a VAST Webmail server onto a computer away from home or another device, such as a mobile phone. IMAP creates a constant connection between the client and Webmail. If you do not want to use IMAP, the VAST POP3 Server can be used instead. cannot be sent remotely unless one of these methods is used. 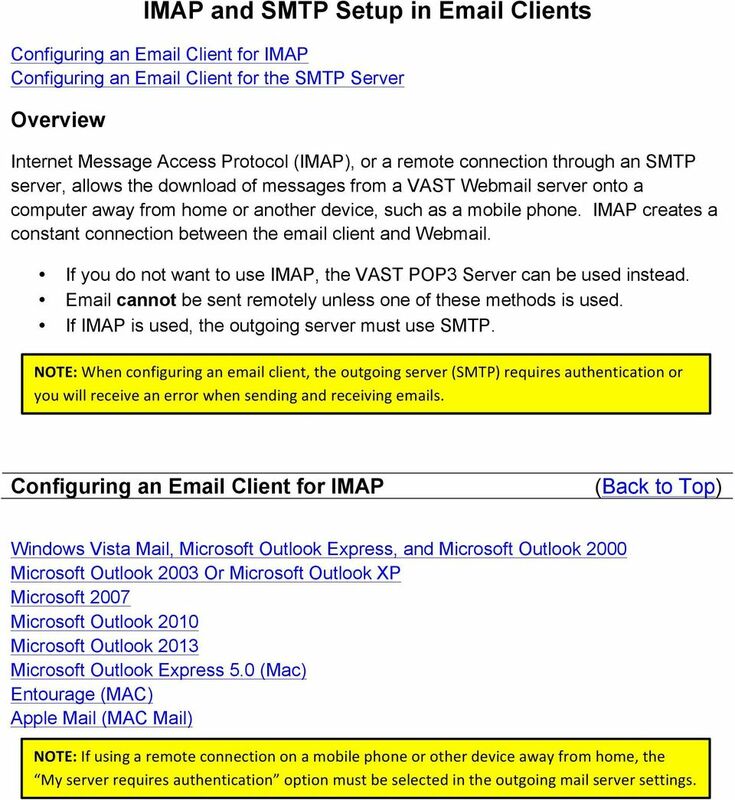 If IMAP is used, the outgoing server must use SMTP. 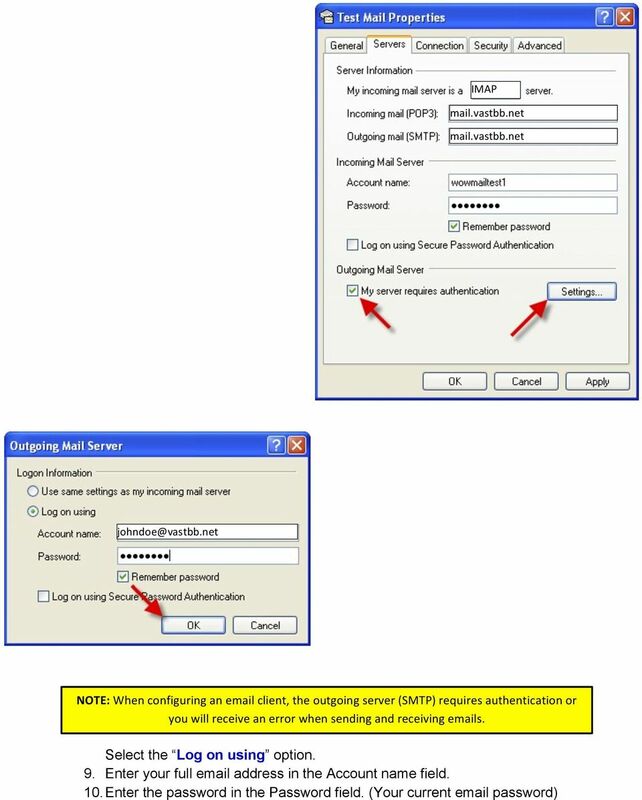 NOTE: When configuring an client, the outgoing server (SMTP) requires authentication or you will receive an error when sending and receiving s. Configuring an Client for IMAP (Back to Top) Windows Vista Mail, Microsoft Outlook Express, and Microsoft Outlook 2000 Microsoft Outlook 2003 Or Microsoft Outlook XP Microsoft 2007 Microsoft Outlook 2010 Microsoft Outlook 2013 Microsoft Outlook Express 5.0 (Mac) Entourage (MAC) Apple Mail (MAC Mail) NOTE: If using a remote connection on a mobile phone or other device away from home, the My server requires authentication option must be selected in the outgoing mail server settings. 2 Windows Vista Mail, Microsoft Outlook Express, and Microsoft Outlook Click the Accounts option in the drop down menu. 3. Click the Add button. 4. Select the Mail option. 5. Enter your name in the Display Name field. a. This is the display name that you would like it to appear in the From field in outgoing s, and does not have to the be your real name. 6. Click the Next button. 7. Enter your full address. (ex. 8. Click the Next button. 9. Select the IMAP option (instead of POP3) in the Server Type drop down menu. 10. Enter the appropriate incoming server in the Incoming Server field. 11. Enter the appropriate outgoing server in the Outgoing Server field. 12. Select the My server required authentication option. 13. Click the Next button. 14. Enter the full address in the Username field. (ex. 15. Enter the password in the Password field. (your current password) 16. Click the Next button. 17. Click the Finish button. 18. Click the Close button. 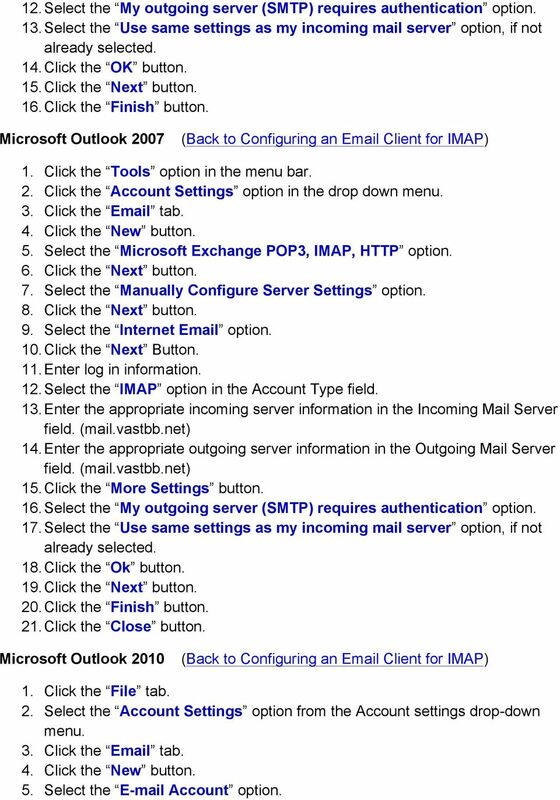 Microsoft Outlook 2003 or Microsoft Outlook XP Client for IMAP) (Back to Configuring an 2. Click the Accounts option in the drop down menu. 3. Select the Add a New Address option. 4. Click the Next button. 5. Select the IMAP option. 6. Click the Next button. 7. Enter the log in information. 8. Enter the appropriate incoming server in the Incoming Mail Server field. 9. Enter the appropriate outgoing server in the Outgoing Mail Server field. 10. Click the More Settings tab. 11. Click the Outgoing Server tab. 3 12. Select the My outgoing server (SMTP) requires authentication option. 13. Select the Use same settings as my incoming mail server option, if not already selected. 14. Click the OK button. 15. Click the Next button. 16. Click the Finish button. Microsoft Outlook Click the Account Settings option in the drop down menu. 3. Click the tab. 4. Click the New button. 5. 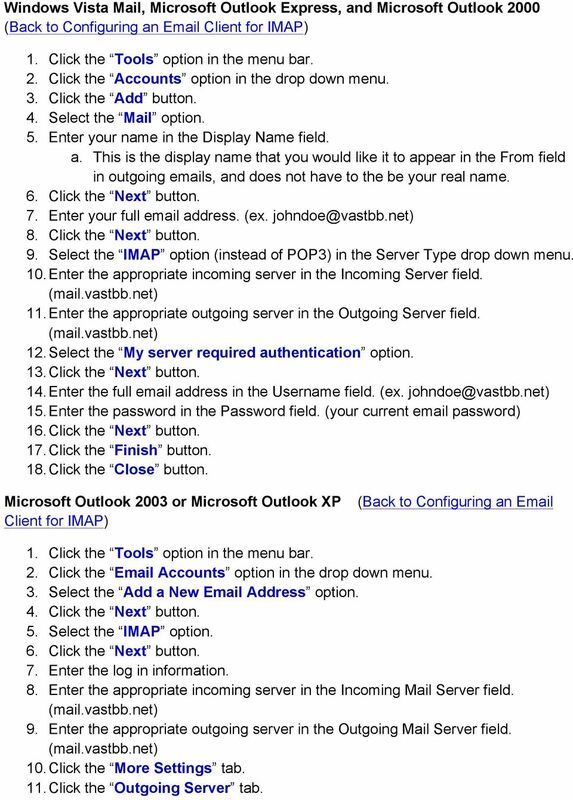 Select the Microsoft Exchange POP3, IMAP, HTTP option. 6. Click the Next button. 7. Select the Manually Configure Server Settings option. 8. Click the Next button. 9. Select the Internet option. 10. Click the Next Button. 11. Enter log in information. 12. Select the IMAP option in the Account Type field. 13. Enter the appropriate incoming server information in the Incoming Mail Server field. 14. Enter the appropriate outgoing server information in the Outgoing Mail Server field. 15. Click the More Settings button. 16. Select the My outgoing server (SMTP) requires authentication option. 17. Select the Use same settings as my incoming mail server option, if not already selected. 18. Click the Ok button. 19. Click the Next button. 20. Click the Finish button. 21. Click the Close button. Microsoft Outlook Click the File tab. 2. Select the Account Settings option from the Account settings drop-down menu. 3. Click the tab. 4. Click the New button. 5. Select the Account option. 4 6. Select the Manually configure server settings or additional server types option. 7. Click the Next button. 8. Select the Internet option. 9. Click the Next button. 10. Enter your name or nickname in the Your Name field. 11. Enter your full address in the Address field. (ex. 12. Select the IMAP option from the Account Type drop-down menu. 13. Enter the appropriate incoming mail server in the Incoming Mail Server field. 14. Enter the appropriate outgoing mail server in the Outgoing Mail Server (SMTP) field. 15. Enter your VAST in the User Name field. (ex. 16. Enter the password for the username in the Password field. (your current password) 17. Select the Remember password option, if not already selected. 18. Click the More Settings button. 19. Click the Outgoing Server tab. 20. Select the My outgoing server (SMTP) requires authentication option. 21. Select the Use same settings as my incoming mail server option, if not already selected. 22. Click the Ok button. 23. Click the Next button. a. Outlook will test the connection. If the test fails, ensure you can access Webmail. 24. Click the Close button. 25. Click the Finish button. 26. Click the Close button. Microsoft Outlook Click the File tab. 2. Select the Account Settings option from the Account Settings drop-down menu. 3. Click the tab. 4. Click the New button. 5. Select the Manual setup or additional sever types option. 6. Click the Next button. 7. Select the IMAP option. 8. Enter your name or nickname in the Your Name field. 6 2. Select the Accounts option in the drop down menu. 3. Click the Mail tab. 4. Click the New button in the upper left hand corner of the window. 5. Click the Mail pull down. 6. Enter your name in the Display name field. a. This is the display name as the you would like it to appear in the From field in outgoing s, and does not have to be your real name. 7. Click the arrow button in the lower left hand corner of the window 8. Enter your address in the I already have an address I d like to use field. (ex. 9. Click the arrow button in the lower left hand corner of the window. 10. 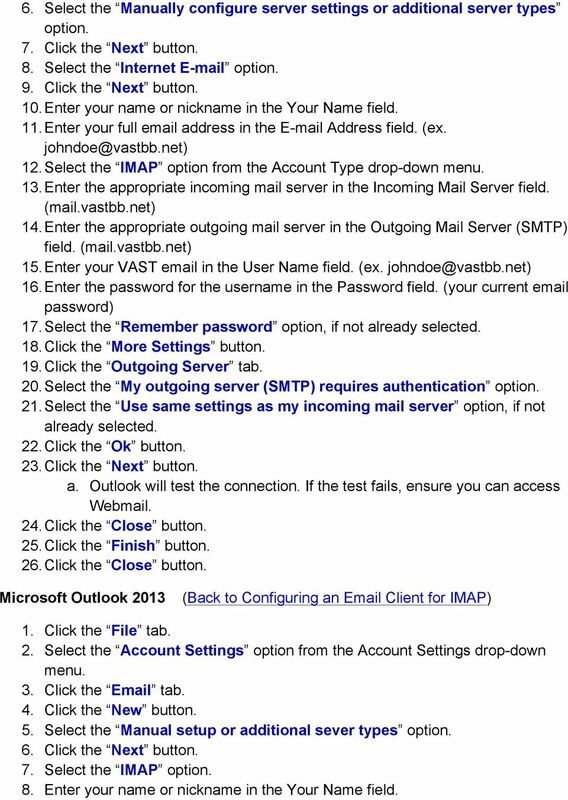 Select the IMAP option from the Incoming Mail Server drop down menu. 11. Enter the appropriate incoming server in the Incoming Mail Server field. 12. Enter the appropriate outgoing server in the Outgoing (SMTP) Mail Server field. 13. Click the arrow button in the lower left hand corner of the window 14. Enter the username (the full address) in the Account ID field. (ex. 15. Enter the password in the Password field. (Your current password) 16. Click the arrow button in the lower left corner of the window. 17. Enter any desired name that will identify this account. 18. Click the Finish button. Apple Mail (Mac Mail) 1. Click the Mail option in the menu bar. a. If it is the first time setting up an account, a wizard will walk you through the steps. b. If the wizard does not appear, open up the wizard: i. Click the File menu. ii. Select Add Account to launch the wizard. 2. Enter the requested information: a. Full Name b. Address c. Password 3. If enabled, click the Automatically set up account option to disable it. Note: If you do not have the Automatically set up account option: 1. Press and hold the Option key on the keyboard, which is located to the left or right of the spacebar. The Create button will change to continue. 2. While holding the Option key, click the Continue button. 7 4. Click the Continue button. 5. Select IMAP from the Account Type menu. 6. Enter the requested information: a. Description Optional b. Incoming Mail Server c. Username enter the full address d. Password Whatever password you set for the account. 7. Click the Continue button. 8. Enter the requested information: a. Description Optional b. Outgoing Mail Server c. Check the Use only this server option if you only uses VAST d. Check the Use Authentication option. 9. Click the Continue button. 10. Check the Take account online option to download mail immediately. 11. Click the Create button when done. 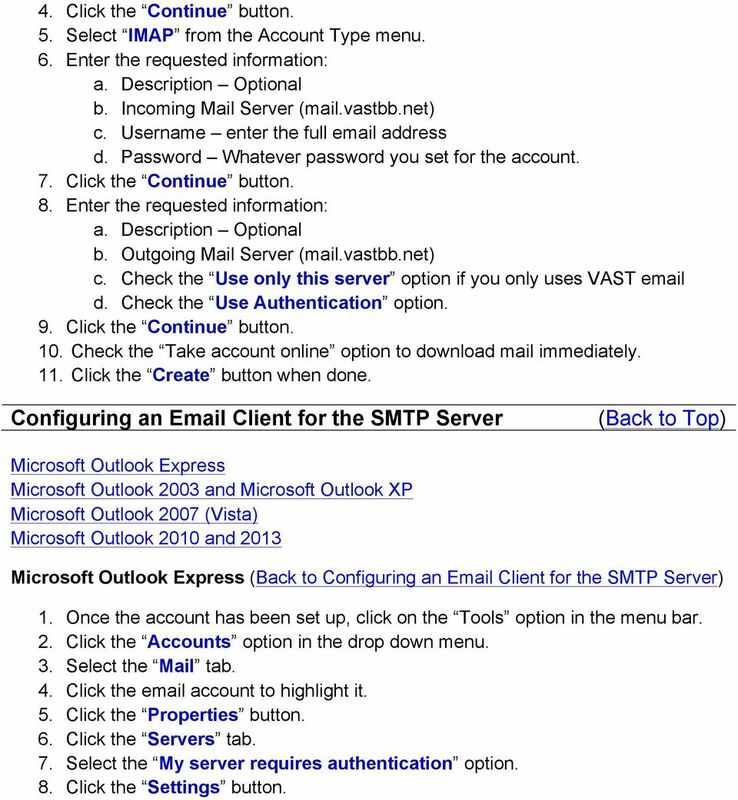 Configuring an Client for the SMTP Server (Back to Top) Microsoft Outlook Express Microsoft Outlook 2003 and Microsoft Outlook XP Microsoft Outlook 2007 (Vista) Microsoft Outlook 2010 and 2013 Microsoft Outlook Express (Back to Configuring an Client for the SMTP Server) 1. Once the account has been set up, click on the Tools option in the menu bar. 2. Click the Accounts option in the drop down menu. 3. Select the Mail tab. 4. Click the account to highlight it. 5. Click the Properties button. 6. Click the Servers tab. 7. Select the My server requires authentication option. 8. Click the Settings button. 9 11. Click the OK button. 12. Click the Close button. 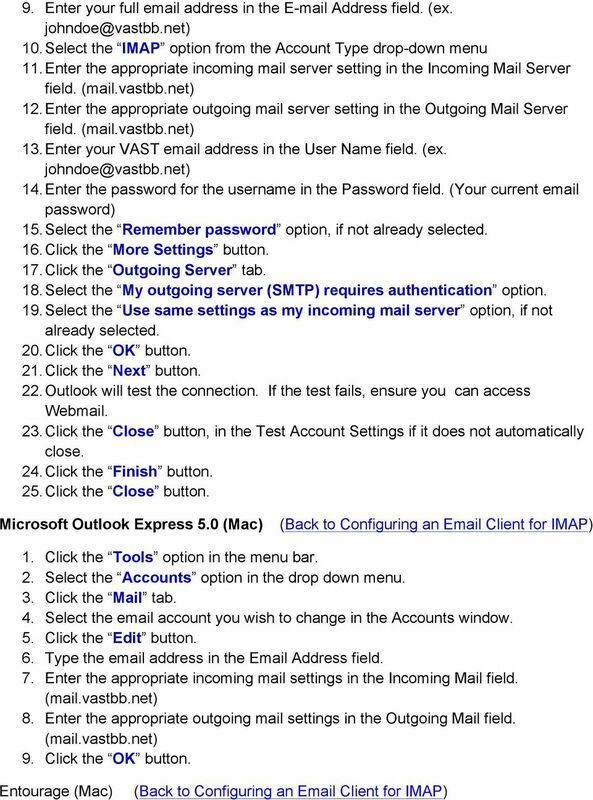 Microsoft Outlook 2003 and Microsoft Outlook XP Client for the SMTP Server) (Back to Configuring an 2. Click the Accounts option in the drop down menu. 3. Select the Add a new Account option. 4. Click the Next button. 5. Select the IMAP option. 6. Click the Next button. 7. Enter your name in the Display Name field. This is how the From field will appear for outgoing s, it does not have to be your real name 8. Enter your entire address in the Address field. (ex. 9. Enter the appropriate server settings in the Incoming mail server field. 10. Enter the appropriate server settings in the Outgoing mail server field. a. Select the My server requires authentication option. b. Enter the full address in the User Name field. (ex. 11. Enter the password you use to log into your Homepage in the Password field. (Your current password) 12. Select the Remember Password option. 13. Click the Test Account Settings button. a. A small window will appear showing the test results. All green check marks indicate that all tests have been passed and the account works. 14. Click the Finish button. 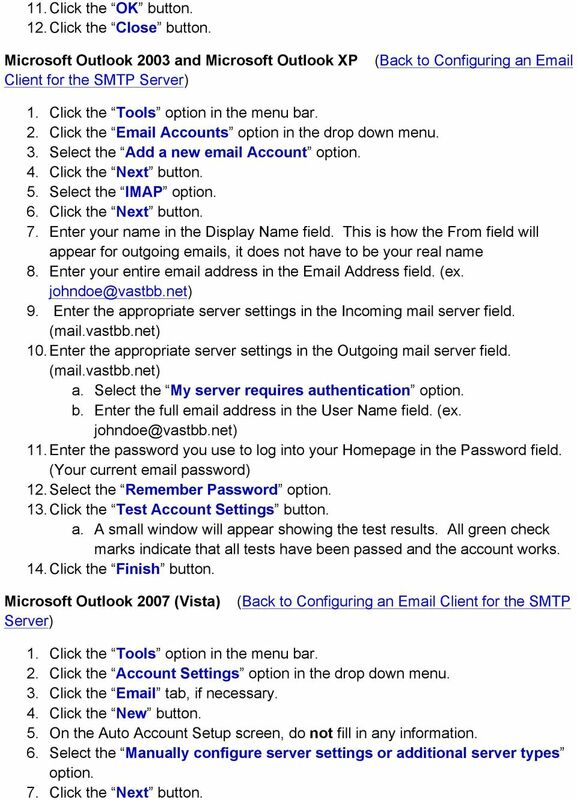 Microsoft Outlook 2007 (Vista) Server) (Back to Configuring an Client for the SMTP 2. Click the Account Settings option in the drop down menu. 3. Click the tab, if necessary. 4. Click the New button. 5. On the Auto Account Setup screen, do not fill in any information. 6. Select the Manually configure server settings or additional server types option. 7. Click the Next button. 10 8. Select the Internet option. 9. Click the Next button. 10. Enter your name in the Display name field. a. This is the display name as you would like it to appear in the from field in outgoing s, and does not have to be your real name. 11. Enter your address in the Address field. 12. Select the IMAP option from the Account Type drop down menu. 13. Enter the appropriate server settings in the Incoming mail server field. 14. Enter the appropriate server settings in the Outgoing mail server field. 15. Enter the full address in the User Name field. (ex. 16. Select the Remember Password option 17. Click the More Settings button. 18. Click the Outgoing Server tab. 19. 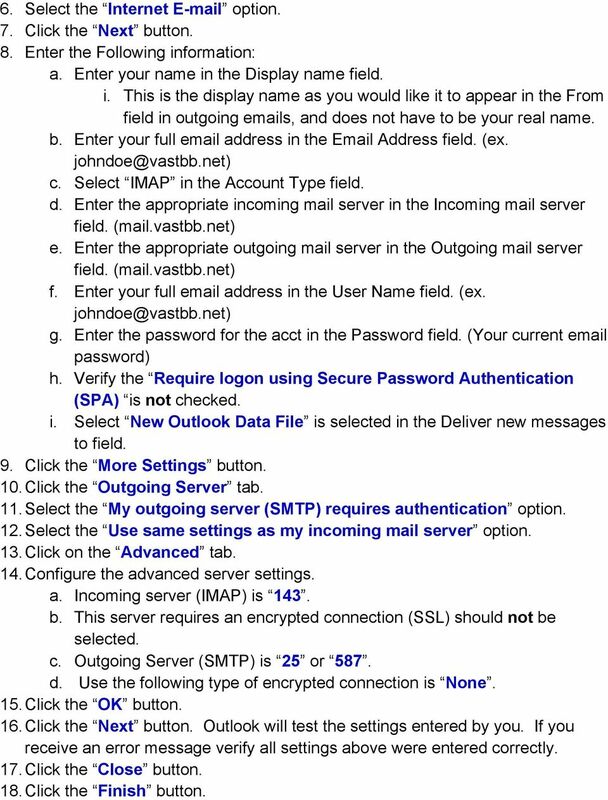 Select the My outgoing server (SMTP) requires authentication option. 20. Select the Use same settings as my incoming server option. 21. Click the OK button. 22. Click the Advanced tab. 23. Verify the Incoming server (IMAP) is Verify the Outgoing server SMTP is 25 or Verify the This server requires an encrypted connection (SSL) option is not selected. 26. Verify the None option is selected in the encrypted connection drop down menu. a. If you want to check from multiple locations. The Leave a copy of messages on the server option must be checked. 27. Click the OK button. 28. Click the Next button. 29. Click the Finish button. 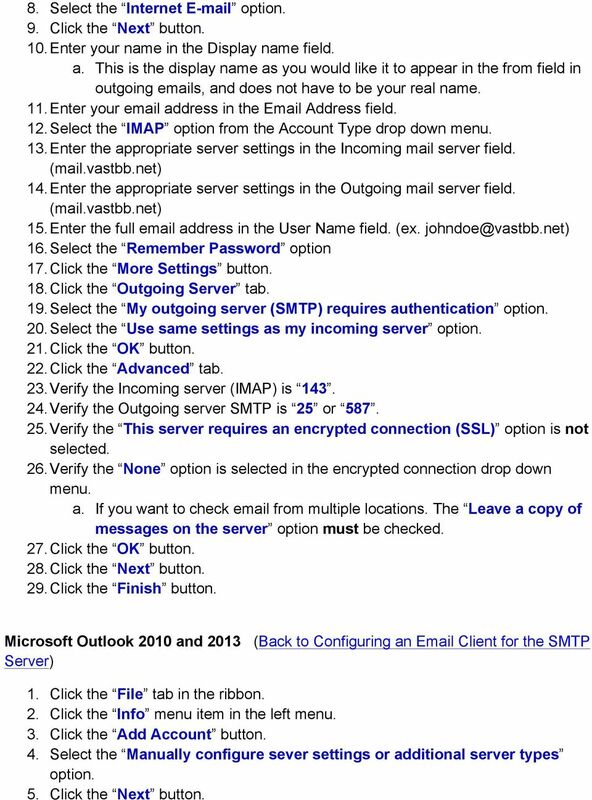 Microsoft Outlook 2010 and 2013 (Back to Configuring an Client for the SMTP Server) 1. Click the File tab in the ribbon. 2. Click the Info menu item in the left menu. 3. Click the Add Account button. 4. Select the Manually configure sever settings or additional server types option. 5. Click the Next button. 11 6. Select the Internet option. 7. Click the Next button. 8. Enter the Following information: a. Enter your name in the Display name field. i. This is the display name as you would like it to appear in the From field in outgoing s, and does not have to be your real name. b. Enter your full address in the Address field. (ex. c. Select IMAP in the Account Type field. d. Enter the appropriate incoming mail server in the Incoming mail server field. e. Enter the appropriate outgoing mail server in the Outgoing mail server field. f. Enter your full address in the User Name field. (ex. g. Enter the password for the acct in the Password field. (Your current password) h. Verify the Require logon using Secure Password Authentication (SPA) is not checked. i. Select New Outlook Data File is selected in the Deliver new messages to field. 9. Click the More Settings button. 10. Click the Outgoing Server tab. 11. Select the My outgoing server (SMTP) requires authentication option. 12. Select the Use same settings as my incoming mail server option. 13. Click on the Advanced tab. 14. Configure the advanced server settings. a. Incoming server (IMAP) is 143. b. This server requires an encrypted connection (SSL) should not be selected. c. Outgoing Server (SMTP) is 25 or 587. d. Use the following type of encrypted connection is None. 15. Click the OK button. 16. Click the Next button. Outlook will test the settings entered by you. If you receive an error message verify all settings above were entered correctly. 17. Click the Close button. 18. Click the Finish button. 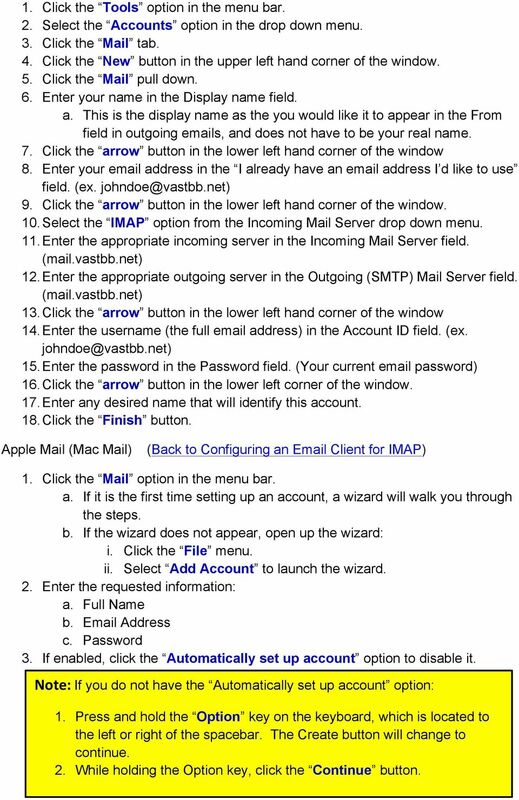 MAC OS X 10.5 Mail Setup Automatically Configuring Mail Manually Configuring Mail Changing Mail Settings Automatically Configuring Mail Mail in Mac OS X 10.5 includes the automatically set up account option.